For many students, essay writing is a tedious enough task by itself, and spending time on essay proofreading may look even more bleak and boring. Yet actually, proofreading is an essential part of the writing process, and not just something to kill time. Here’re some tips to help you proofread your papers effectively. A fresh eye – or even a fresh perspective – is vital for good proofreading. After you’re done with your essay, it’s better to do something totally different from writing. When you take up the essay again, any mistakes or typos which your hackneyed eye failed to detect will stand out. As far as fresh perspective goes, your friends may very well be of service: it’s their first time that they see your writing, so they’ll easily spot any errors. In an extreme case, if you have absolutely no time to let the essay sit awhile (for instance, if it’s almost nighttime and the paper is due tomorrow morning), you might want to order proofreading services from a specialized agency online. Changing the way you look at your writing goes a long way, too. After typing it on the computer, it often helps to print the text out – in another font and with a different layout: this way typos or mixed-up words will likely pop up before your eyes. Reading the text aloud slowly allows you to spot cases of tautology, missing words, grammar mistakes such as wrong noun-verb agreement and pronoun use, and the like. Furthermore, read your essay backwards, word by word. This method is perfect for pinning down typos, spelling mistakes or wrong word usage. It’s wise to proofread the essay not in one go, but have several takes on it, focusing your attention on a separate aspect each time: first, spelling, then grammar, then structure and style. It might seem more time-consuming, but in fact, if you try to correct every possible mistake with one swoop, you are likely to get confused and to miss some of them. Don’t rely too much on spellcheckers, neither on those in your word processor nor on standalone ones – they’re good for nothing more than blatant typos or spelling mistakes. And they certainly are of no help in checking personal names, dates, figures and facts – in this case you have to rely solely upon yourself. Be sure to dot all i’s and cross all t’s, because even one factual blunder can ruin your professor’s impression of your essay. If you’re not new to academic writing, you probably are well aware what areas you need to pay extra attention to. 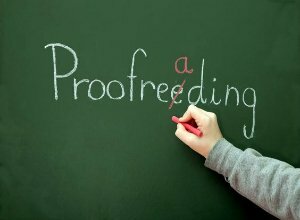 Prepare your personal proofreading checklist and address different issues in order of importance. Proofreading is not some arcane practice which only the chosen ones can master. On the contrary, this handy system can make you more focused, save you many a disappointing academic experience and add a final touch of luster to your papers. Good luck!